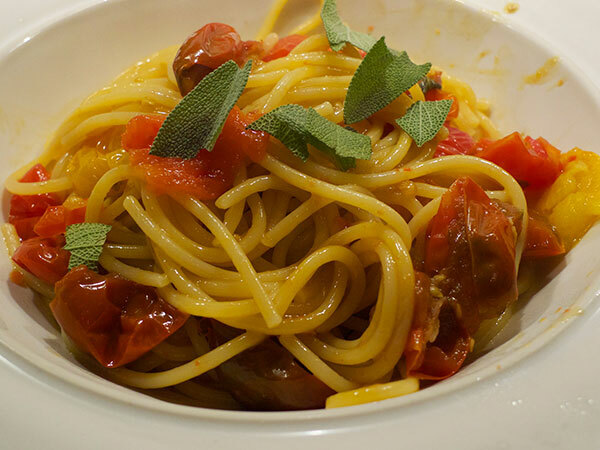 Fresh cherry tomatoes are still good so it’s a fine time to use them in pasta. Here are two preparations that look similar in photographs but could not taste more different. Bring large pot of salted water to the boil and add pasta. Set timer to 1-2 minutes short of recommended pasta cooking time. Slice the tomatoes in half and salt them generously. Heat olive oil, add garlic and habanero, and when you can smell the garlic, add the tomatoes, cut side down, and turn heat up to medium or medium high so that they start to wilt and caramelize on the bottom. Do not move the tomatoes. When pasta is just short of al dente, lift it out of the pot with tongs (do not drain it) and add it to the tomatoes. Cook quickly until pasta is done, adjusting seasoning to taste. Serve with torn sage leaves and without cheese. Plenty of fresh-ground black pepper should be available on the table. Bring a large pot of salted water to the boil and start cooking the pasta. Meanwhile, slice the tomatoes in half and gently squeeze out and discard all the juice and seeds. Salt the open halves of the tomatoes. Melt HALF the butter in a skillet and then add the garlic. When the garlic is very lightly browned, add the tomatoes, cut side down, with another 1/2 tsp salt or to taste. Simmer gently for about 15 minutes, pressing the tomatoes down with a wooden spoon so that they disintegrate and become saucy, and stirring frequently. Add the nutmeg and simmer another 4 minutes. Add the basil leaves and stir, and remove from heat. 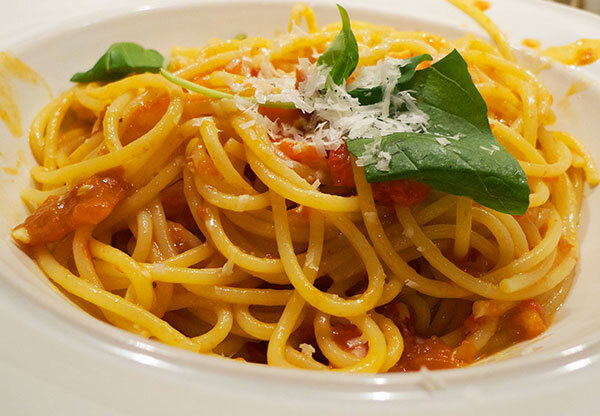 When pasta is about 1-2 minutes from al dente, remove a ladle of pasta water and reserve. Drain pasta and return to pot. Add the remaining 3 tbs of butter and the grated pecorino and stir well to combine. Add the tomatoes and toss to combine, adding a little of the pasta water. Serve with extra torn basil leaves on top, along with fresh pecorino romano for grating and black pepper at the table.